Ally Myers, PA-C is certified by the National Commission on Certification of Physician Assistants. As a physician assistant, she works alongside the First Coast Heart & Vascular physicians in evaluating patients, ordering diagnostic testing and developing a treatment plan for a variety of cardiac conditions. Even as our newest member of the team, she has proven to be passionate about cardiology and forming relationships with her patients. 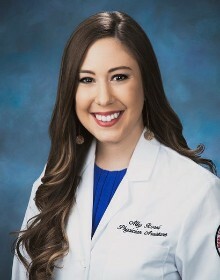 Ally grew up as an avid gator fan and earned her Bachelor’s degree in Biology with a minor in nutritional sciences at the University of Florida in Gainesville. She attended Nova Southeastern University for her Master’s degree in Medical Sciences, where she graduated as a Physician Assistant with honors. Ally moved to Jacksonville for graduate school and has been in the area since 2016. She currently works out of both our Jacksonville and St. Augustine offices, as well as Memorial Hospital and Flagler Hospital.